As President Trump is sworn in, thousands of people are protesting by dropping banners all over the world to spread the message that we need to build bridges, not walls. Below I share a little about my experience of taking part and the breadth of the action, reflecting on why it has been so successful, and looking to the future. I ask – how can we remain hopeful & organise against the rise of the right? This morning I was up at 6am and it was literally freezing in London. Actually below freezing to begin with. It’s the day ‘President Trump’ becomes an actual thing, so for me it should have been a fairly depressing day, with such a symbolic victory of the rise of the far right so prominently in the news and on everyone’s minds. But I actually felt really excited and hopeful. I was up early to drop a #blacklivesmatter banner from London Bridge with lots of other amazing people as part of the Bridges Not Walls day of action. People responded strongly to the simple call to action (see below) by the central UK activist team behind Bridges Not Walls on their website – the last time I looked there were 250+ actions planned across five continents. This is an open invitation for everyone moved to stand up to the rise of the far right here and around the world. There are so many good reasons to protest this moment that it’s impossible to fit them all on one banner. Bridges Not Walls is a chance to say what you want to say about it, in your own words, but as part of a bigger collective project that connects the dots between all of our concerns. 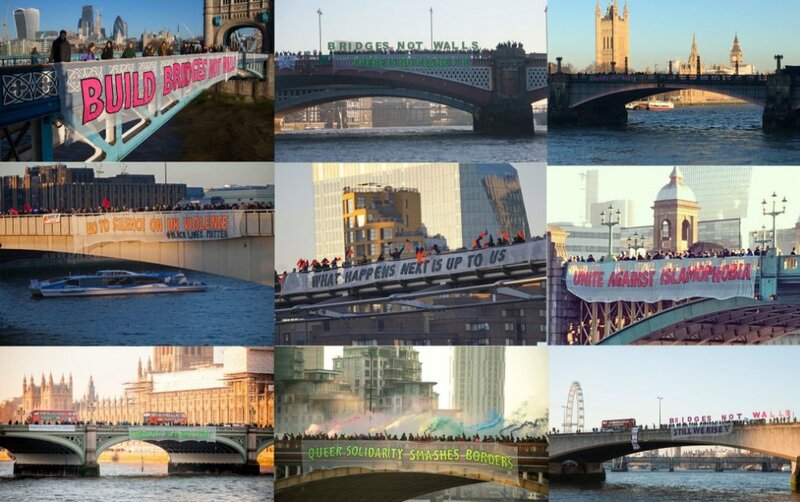 Simply organise to meet on a bridge near you, with a banner carrying your message, and take a photo. These photos will be collected centrally and their messages shared far and wide. This action has been remarkably effective. While I’ve been writing this, #bridgesnotwalls has hovered around 2nd-3rd place in the global trends on twitter. All day, people went onto twitter, found the hashtag, and posted tweets in response saying how grateful and moved they were at this global response to the inauguration. It gave people hope. UK actions have smashed regional, national and international media, hitting usual suspects like the Independent and the Guardian alongside the BBC Breakfast and even the Daily Mail. People’s voices are certainly getting heard. The call to action is so simple and clear, it offers a recipe anyone with a couple of friends could follow to take action locally. At the same time, these local actions connect with others run by like minded people all over the world, so those taking part felt their efforts would have genuine impact beyond their own actions. People just needed to make a banner, find a bridge, take a picture and share on social media. While inviting everyone to share their own messages to get a multitude of perspectives, the action had a few clear key messages which people could understand. a) It was in opposition to divisive politics and the rise of the far right everywhere, not just in America; b) People were standing together in solidarity with marginalised groups who are most affected; and c) We need to take action – what happens next is not already written, it’s up to us. Use of tech was important, with a simple website that allowed people to register their actions on a map. Anyone wanting to take part could then go to the map and find banner drops nearby to get involved with. The website also contained everything organisers needed, from a template press release and social media guide to a legal briefing. The action revolved around the need for people to come together to get creative and actually make their banner. Having this at the heart of the call to action helped people connect with each other, building investment in the action and the group. The action’s strength came from its blend of central coordination with it’s de-centralised approach to getting involved. The activists who came up with the plan and made this happen have put in a huge amount of hard work, helped along the way by lots of enthusiastic volunteers. Promotion was really important, spreading the word far and wide so people heard about it and knew to get involved. Partly this was organic because the idea was sticky and sharable, but it also owes a debt to all the organisations that have supported it (there were actually too many for me to count), from giants like Greenpeace to local groups like Divest Hackney. Today’s actions were just the start. What happens next is up to us. It may feel huge, insurmountable and hopeless to start healing divisions and finding an equitable and just way forwards as neoliberal capitalism crumbles. But we have to do it. Alone we are weak but together we’re powerful. We genuinely don’t know what will happen next. Ask yourself, what would you have done if you were living in times of great historical injustice, when the far right has risen before? Are there parallels with the world we’re facing now? If people start to act, something new will emerge. Look for opportunities and start with those you love. Oppositional, divisive action in any form won’t help us find a way out of this mess. We need to learn again to listen to each other, bridge divides, and more forward for common benefit. I was really inspired by this article on Open Democracy, which reflecting on factors which undermine and strengthen solidarity, sharing practical lessons learned from the Skills Network, a women’s cooperative in south London. To hope is to give yourself to the future – and that commitment to the future is what makes the present inhabitable. Previous Post Brexit: Is ‘self care’ enough? What about collective care? Pingback: Building Bridges, Not Walls | Damn you, curfew!